Well, I don’t know about the rest of you, but I’m rather over it already. In the last 24 hours, these are just a few examples of how things are shaping up. On the politician front, we saw Clive Palmer, head of the Palmer United Party, assert that Prime Minister Kevin Rudd was ‘afraid’ to debate him. This fear, he claimed, was because Labor had no ideas, and couldn’t make a decent counter-argument to his calls for a ‘revolution’. I didn’t see any flags or chanting crowds with upraised fists, and Palmer wasn’t wearing a beret with a red star badge on it, so I’m not quite sure what he means by that. But then, he could be right. It’s hard to make a counter-argument when there isn’t something against which to argue. Of course, had Julia Gillard still been Prime Minister, we’d have heard nothing of the kind. Likely, Abbott would have given us one of his trademark snide comments, while reminding us all that he’s married with kids. At least that issue is neutralised, though that’s hardly something of which we should be proud. The presence or absence of family is in no way an indicator of whether someone can be an effective Prime Minister. With his early morning media appearances over, Abbott decided to get some work done early. No sense waiting until the election actually takes place, is there? Of course not. Democratic process? Pffft. 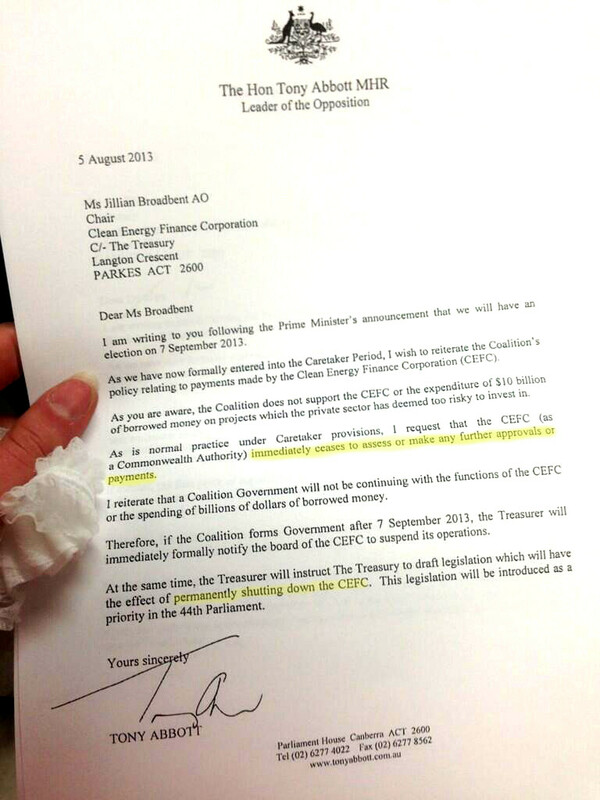 Abbott wrote to the Clean Energy Finance Corporation, virtually instructing them to cease their activities. Thoughtfully, he also gave its employees plenty of advance notice that he’d be shutting them down altogether once he was in government. 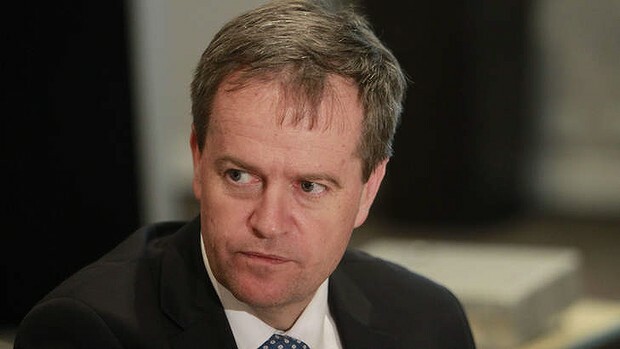 While he was at it, he told the media that he’d informed the Department of Prime Minister and Cabinet of his first activity as Prime Minister – which would, of course, be repealing the ‘carbon tax’. The arrogance is breathtaking. Publicly, Abbott’s out there saying it’s going to be a long, hard fight, that it’s hard to win from Opposition, that Labor has the advantage. Privately, he’s already throwing his weight around the Canberra bureaucracy, claiming the authority of a Prime Minister and, apparently, expecting to be treated like one. And then there were the Greens. Oh dear, dear, dear. Now, no one could ever accuse the Greens of lacking in absolute commitment to their principles, and a willingness to pursue them with passion. But leader Christine Milne’s media conferences last night and today were, frankly, cringe-worthy. She spent the bulk of her media time calling both major parties ‘cruel’, so many times that even experienced commentators lost count. This was largely directed at their respective asylum seeker policies, and it’s fair to say that at best those policies could be considered completely self-interested. A word repeated too many times, however, loses its impact, and that’s what happened here – particularly after Milne extended her accusations of cruelty to include environmental policies. The other problem was that Milne backed herself into a corner on the issue of another possible minority government. After her condemnation of both Labor and the Coalition on asylum seeker policy, she stated flatly that the Greens would not, under any circumstances, enter into an agreement with the Coalition. Of course, the natural follow-up question was, would the Greens back Labor – and that’s where she came unstuck. It was clear Milne was more inclined to agree to that arrangement, but since she’d described both parties as almost identical in their ‘cruelty’, she had no justification for saying so. Instead, she fell back on repeating she wouldn’t support Labor’s ‘Papua New Guinea gulags’. To say the media smelled blood in the water then was an understatement. Her appearances dissolved into incoherence. The Daily Telegraph’s front page left us in no doubt as to their opinion. 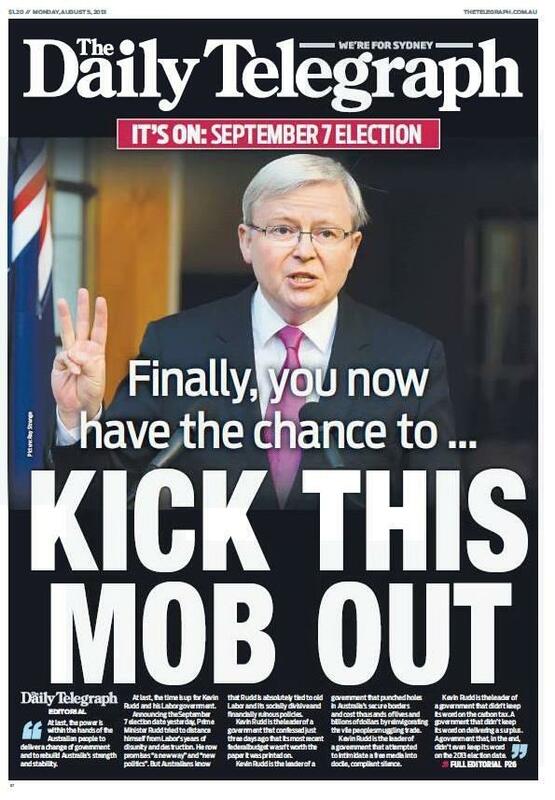 The Daily Telegraph’s calm and measured start to its election campaign coverage. Hilariously, the paper solemnly assured us that it was declaring its support for the Coalition ‘calmly and reasonably’, that it would not ‘play Labor’s game’. I pause for howls of derisive laughter. News Limited can hardly be accused of showing bias towards the government. A quick perusal of their headlines and op-eds shows that. For them to claim otherwise is a bald-faced lie. Today’s headline, though, goes one step beyond even Fairfax’s pathetic bleat that under Gillard’s leadership, it was impossible for the media to have a policy-driven debate. The Telegraph isn’t merely complaining. It’s outright telling people how to vote. Yes, this tends to happen as a campaign goes on, but on Day 1? In tones best reserved for a pub owner dealing with a few rowdy drinkers? And on the front page? This is nothing more than the Tele treating its readers as mindless mugs. Where Fairfax wrung its hands and wailed, News Ltd has opted for the blunt instrument approach. It’s crass, it’s obvious, and it’s insulting. Finally, this piece of do-it-yourself campaign material deserves a mention, if only because it shows just how toxic the political atmosphere is right now. These pages are accompanied by selected ‘Letters to the Editor’ badly clipped out, pasted crookedly and photocopied, with helpful commentary in the white spaces. 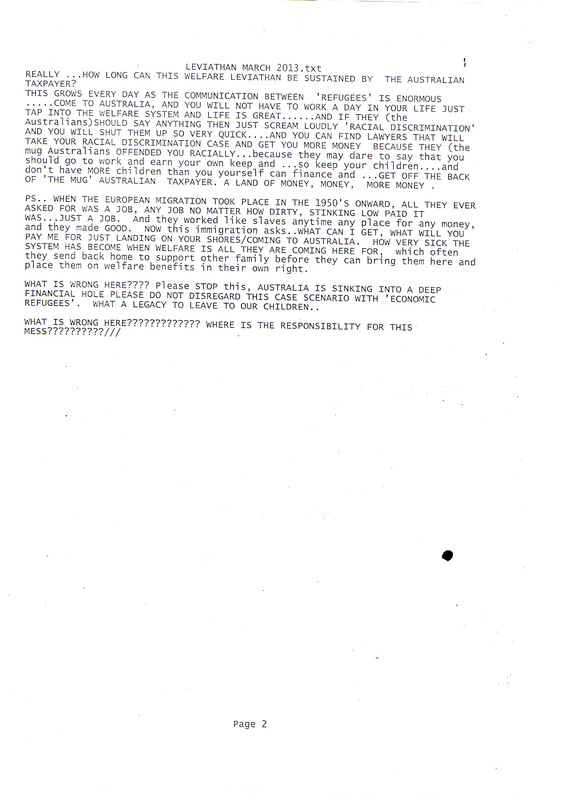 There’s no organisation identified as being behind this material, although the use of the word ‘LEVIATHAN’ to name the text file from which it’s printed suggests the author’s have read at least a few articles in The Australian or the odd right-wing blog (which is rather fond of using that word to describe welfare or taxation of any sort). Nonetheless, this is the direct result of a political discourse that thinks nothing of using a vulnerable group of faceless people as little more than a football. Scoring political points by stirring up ill-feeling against asylum seekers is, unfortunately, an effective tactic. It panders to the most xenophobic aspects of human character – and in doing so, tacitly gives approval for the kind of propaganda that paints all asylum seekers as potential welfare cheats, breeding uncontrollably in order to overwhelm the ‘real’ Australians and bring in sharia law. I’m sure there’s more out there, from Christopher Pyne absurdly claiming three different policy decisions in less than 24 hours to the Katter Australian Party supporter in a giant hat who photo-bombed an ABC News24 reporter who was desperately trying to fill time while waiting for the Prime Minister’s plane to land. And it’s only Day 1. Strap in, folks, and lay in a good supply of whatever gets you through all this. ‘L’ Plate Cabinet or Safe Pairs of Hands? There’s not going to be a blog about last week’s non-spill in the Labor Party. I considered it, but then … what was the point? Really? What could be said that wasn’t either pointing out the obvious, or banging my head against a wall of stupidity in both mainstream and social media? So, in the immortal – and dreadfully twee – words of the Prime Minister’s last election campaign … this blog is ‘moving forward’. (Ugh. Who thought of that, anyway? Worst. Campaign slogan. EVER.) Last Friday, a slew of Ministers and Parliamentary Secretaries offered their resignations, which the PM accepted (the exception being Simon Crean, who was sacked after he publicly called for the leadership spill and excoriated the government in the process of doing so). Martin Ferguson, Joel Fitzgibbon, Kim Carr, Janelle Saffin, Ed Husic, and Chris Bowen all went to the backbench, leaving the PM no choice but to reshuffle. Usually, a reshuffle is not terribly good for headlines. Sometimes you get an unexpected inclusion (such as Gillard’s oft-criticised decision to appoint Rudd as Foreign Minister when he resigned), or a predicted punishment (sending Robert McLelland to the junior ministry after he supported Rudd in his challenge last year). This time, though, there are more than a few areas of interest. First up, we’re only six months out from the September 14 election. That means any new Cabinet has a very short shake-down cruise. Second, Gillard has to show that the government has enough depth of talent to replace those who resigned – no easy task in the case of someone like Martin Ferguson. Leaving aside the posturing, Abbott did have a point. The PM was under pressure to show her Cabinet was not only competent, but experienced – and there weren’t really a lot of choices. Her solution was to side-step altogether the question of who to bring in from the backbench. Her first announced appointment was Anthony Albanese, Minister for Infrastructure and Transport. Added to this is now Regional Development and Local Government. This is a resounding show of confidence in Albanese, whose support for Rudd is well-known. After last year’s failed challenge, he offered his resignation to the PM, who refused. Last week, he told media that he would not try to depose a sitting PM, and that he had, in fact, urged Rudd not to challenge. Nonetheless, many expected him to end up on the backbench. In fact, this is a promotion – and a very pointed one, too. Albanese’s taken on part of Crean’s former responsibilities. It doesn’t take a political genius to see the subtext there. Tony Burke picked up the other half of Crean’s portfolio – Arts. It’s a slightly odd fit with his current position as Minister for Sustainability, Environment, Water, Population and Communities, but Burke has always had a great deal of interest in the Arts. Craig Emerson adds Tertiary Education, Skills, Science and Research to the Trade portfolio. Even with two assisting junior Ministers, this is a huge amount of responsibility. The Department for Climate Change is now merged with Industry and Innovation, all under the purview of Greg Combet. Again, somewhat strange bedfellows here – although, arguably, Combet is now in a position to drive policy encouraging business to innovate in ways that mitigate the effects of climate change. The Greens may not see it that way, however. It will be interesting to see if Christine Milne considers this merger an irreconcilable conflict of interests. Attorney-General Mark Dreyfus also picked up extra responsibilities, adding Special Minister of State, Public Service and Integrity. The appointment of Gary Gray to Resources, Energy, Tourism and Small Business surprised exactly no one. He’s a West Australian, experienced in dealing with the Resources Sector. Jan McLucas is the new Minister for Human Services, and Jason Clare remains Minister for Home Affairs and Justice, but becomes a full Cabinet member. Finally, the PM announced a number of new junior Ministers and Parliamentary Secretaries, including Andrew Leigh, who will now serve as Parliamentary Secretary to Gillard. In a way, this isn’t really a reshuffle at all. With the exception of Gray, McLucas and Clare, there are no new appointments, no moving around. Instead, Gillard’s largely loaded more responsibility onto existing Ministers, effectively creating super-portfolios. And take a look at those Ministers – senior, highly experienced, without a breath of incompetence clinging to them. There’s no Peter Garrett here, forever tainted by the debacle with the insulation program. Yes, Combet’s linked with carbon pricing, and Albanese is associated with Rudd, but there’s no doubt that they have performed well in their positions. More importantly, perhaps, they project the image that they are safe pairs of hands. Cleverly, Gillard has also managed to take some of the wind out of Abbott’s sails in regards to his assertion that there is not enough depth of talent on the government benches. (Dear me, the metaphors are mixing terribly today.) Appointing a whole group of new Parliamentary Secretaries and junior Ministers signals to the electorate that here is the next generation of Ministers, learning their trade while apprenticed to strong, competent mentors. It doesn’t entirely nullify Abbott’s suggestion, but it goes a long way to bringing new faces into public view without exposing them to potential problems. Of course, these new responsibilities also leave the appointees open to questions and criticism regarding their ability to handle the increased workload. They have a little over six weeks to deal with that – and I’m sure there’ll be any number of announcements and media opportunities for them to demonstrate how well they’re doing before they head back to Canberra for the Budget sitting. This is a purely political move for Gillard. She knows she has to demonstrate to the electorate not only unity, but also competence. She has to show that, even in the face of so many resignations, she has more than enough talent on which she can rely. She’s found the best possible way to do that.